Scoliosis: the spine curving abnormally in 1 or more places. Various types of scoliosis can occur. Scoliosis is a musculoskeletal disorder that adversely affects the shape of the spine (backbone). The term for this condition is derived from an ancient Greek word used to describe something obliquely bent or crooked - skoliosis. Basically, scoliosis is when the spine curves abnormally in one or more places. The spine is composed of bones called vertebrae. Normally, when viewed from behind, these bones (vertebrae) run down the back in a straight line. There are normal (front-to-back) curves of the spine; however, scoliosis is a side-to-side curvature of the spine. Therefore, a scoliotic spine (when viewed from behind) will not be straight and may instead look like the letter "C" or "S", due to the side-to-side (right-to-left) curvature. An abnormal curvature of the spine can occur at any age and from a variety of causes. Therefore, scoliosis can be divided into a number of different classifications, each with its own unique features and type of treatment. Adolescent Idiopathic Scoliosis: idiopathic scoliosis affecting children from 10 to18 years of age. Adult Idiopathic Scoliosis: idiopathic scoliosis affecting adults. Post-surgical deformity occurs as a result of previous surgery for scoliosis or spinal fusion. 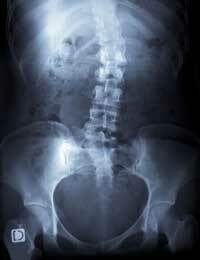 This is typically seen in patients who previously had long fusions of the spine. Many adults with scoliosis have scoliosis that began in childhood or adolescence and continued into adulthood. However, it is also possible to have other types of adult scoliosis. For example, adult degenerative scoliosis results from wear and tear on the spine. Scoliosis is relatively common compared to other musculoskeletal diseases. It is thought to affect approximately 2-3% of the U.S. population. People of all ages can develop scoliosis. For adolescents with scoliosis, curvatures generally get worse during a growth spurt. Scoliosis appears more often in adolescent girls. Also, scoliosis has shown a tendency to run in families.